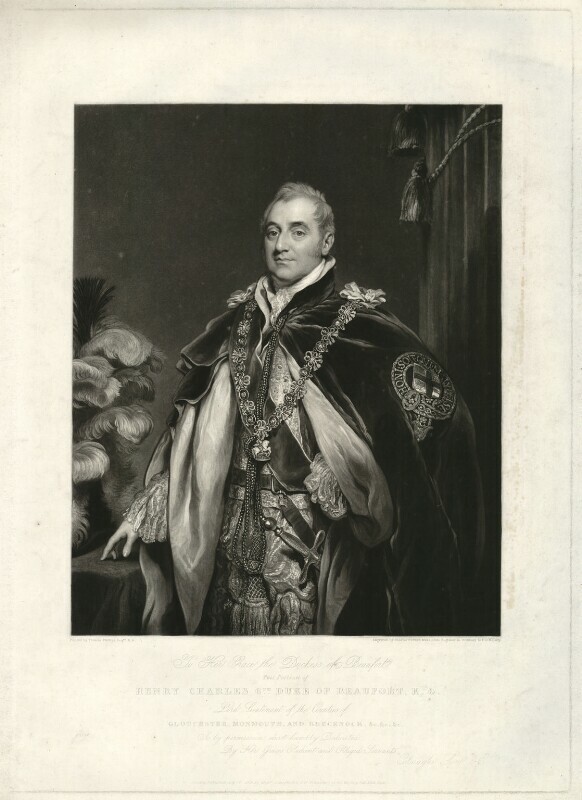 Henry Charles Somerset, 6th Duke of Beaufort (1766-1835), Conservative politician; MP for Bristol, Monmouth Boroughs and Gloucestershire. Sitter in 2 portraits. Thomas Phillips (1770-1845), Portrait painter. Artist associated with 215 portraits, Sitter in 4 portraits. Charles Turner (1773-1857), Engraver. Artist associated with 619 portraits, Sitter in 2 portraits. Duke of Wellington becomes Prime Minister. Madhouse Act attempts to regulate asylums and ensure new arrivals are genuinely insane. Repeal of the Test Acts removes political restrictions from dissenters, allowing them to hold public office. London Zoological Gardens open in Regent's Park. They provide both entertainment and a supply of exotic specimens for naturalists and anatomists such as Richard Owen who becomes a European authority on the subject. Daniel O'Connell is elected Member of Parliament for County Clare but as a Catholic is not permitted to take his seat.